It’s the first of, what is expected to be, many for Rasmus Dahlin. 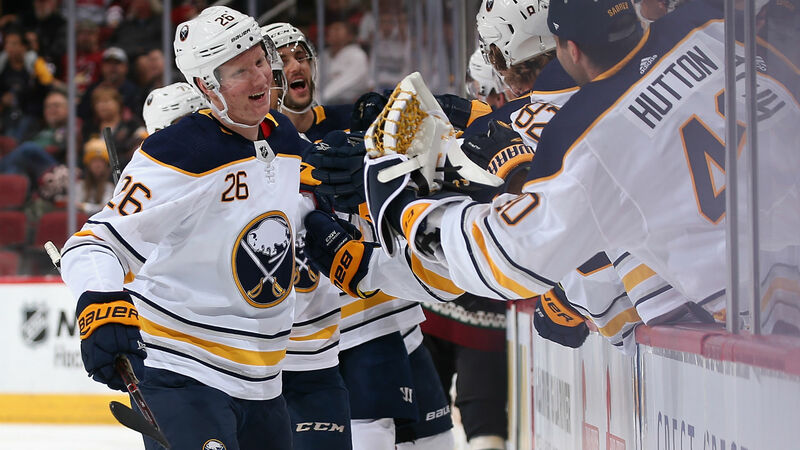 The Swedish-born defenseman scored his first NHL goal in the Buffalo Sabres’ Saturday night matchup against the Arizona Coyotes. Dahlin’s first goal came less than three minutes into the first period, making the 18-year-old the youngest defenseman in Sabres history to register his first goal. The goal was set up by Sabres’ winger Jeff Skinner, who skated past Coyotes’ defenseman Jason Demers, and tried to tuck it in behind goaltender Antti Raanta. Dahlin, driving to the net tapped in the loose puck for the milestone goal. The goal caps a big week for the youngster. On Thursday, he registered his first career point when he asissted on Nathan Beaulieu’s goal against the Avalanche. Dahlin was selected first overall by Buffalo in this year’s NHL Entry Draft, becoming the 15th defenseman selected in the slot all-time. At the 2018 World Junior Ice Hockey Championships he registered six assists while taking home the tournament’s top defenseman honors. Dahlin was also part of Sweden’s 2018 Olympic team in Pyeongchang. Entering the 2018-19 season, Dahlin was named as the NHL’s third-best prospect, behind Vancouver Canucks winger/center Elias Pettersson and Carolina Hurricanes winger Andrei Svechnikov.